Such Is This World@sars.come. Dobbs Ferry, NY: Ragged Banner Press, 2011. 536 pp. Hu Fayun’s Such Is This World@sars.come (written in 2004 and published in 2006) is a novel whose original title, Ru Yan@sars.come,[ 1 ] is likely to prove no less curious and enigmatic to readers of the Chinese than its somewhat awkward English rendering. Yet for those willing to leap over this initial hurdle, the novel proves both rewarding and enlightening. Because Ru Yan@sars.come is the most important work of contemporary Chinese fiction to address the many social ramifications of the 2003 SARS (Severe Acute Respiratory Syndrome) outbreak, the translation is a much welcome addition to the corpus of modern Chinese literature available in English. Through his historical fictionalization of the SARS episode, Hu Fayun (1949-) dramatizes the trials and tribulations of those infected, those (mis)diagnosed, those quarantined, and those whose careers were made or broken in the wake of the virus. The novel furthermore captures the sense of confusion and pandemonium sparked by vague initial accounts of the virus, suspicions of a government cover-up designed to prevent the story from leaking out, and the slow response of official media outlets in providing objective and accurate reports about the scale of the epidemic to a terrified public. Ru Yan is a middle-aged widow and inhabitant of “City X,” most likely the author’s native Wuhan. Before leaving to attend architecture school in France, Ru Yan’s son provides her with a computer and a high-speed Internet connection, thus initiating her into the world of email, instant messaging, chat forums, and websites. In addition to the online companionship she finds on a chat forum called “Empty Nest” (kongchao), where Ru Yan discovers her own capacity for literary expression, she also develops a romantic relationship with Liang Jinsheng, the city’s mayor, after being set up by her colleague at a local state-funded botanical research institute. It is with the outbreak of SARS that Ru Yan’s newly formed on- and off-line worlds collide, and it is through this collision that she sheds her relative naivete toward matters of Chinese officialdom and its mechanisms of social surveillance. Hu Fayun thus exposes the quandary faced by mid-ranking officials whose actions or inaction in response to higher directives, or at their own initiative when such directives have not yet been fully articulated and passed down, will determine their political fortunes. Liang Jinsheng’s political fate is also tied to the unintended consequences of Ru Yan’s first encounter with the Great Firewall and her subsequent crusade to speak truth to power. With news that her brother-in-law in Guangzhou has contracted an “unknown disease, highly contagious,” Ru Yan posts a message of concern cautioning her “Net friends” in the Empty Nest forum to take preventative measures, only to see her post disappear and replaced with a “SERVER ERROR” message: “Ru Yan now realized that in what she had thought was a little salon hosted by herself there was actually an old crone concealed and peering at everything from behind a curtain” (181-182). [ 6 ] Angered by the delayed response of public health officials as well as their dubious diagnostic and heavy-handed quarantine measures, Ru Yan uses the Internet to voice her displeasure, igniting a war of words that draws attention to her city’s relative successes and failures in the fight against SARS. The deletion of Ru Yan’s web posts right before her eyes lends an ironic metafictional twist to Hu Fayun’s novel, as the original manuscript of Such Is This World was posted on a website in 2005 that was shut down within weeks of its initial appearance. As A. E. Clark, the novel’s translator, remarks in his preface, the 2006 Chinese print version “bowdlerized most of the politically sensitive passages” (i). To his credit, Clark has translated Hu Fayun’s original manuscript. When Damo tells Ru Yan, ” As for ‘our country’s internal affairs,’ if we ourselves would only publish them first, nobody would bother going overseas to find out about them” (364),[ 7 ] one cannot help but think that Chinese readers are now forced to turn to the English version to gain access to the novel in its full perspective. A. E. Clark should also be commended for the extensive and meticulous research he obviously performed in translating Such Is This World, evidenced by the copious endnotes (over 50 pages worth! ), which even provide Russian titles and lyrics to songs originally alluded to in Chinese, such as The Little Road, Lamplight, and The Lenin Hills (478). While Clark acknowledges the importance of his annotations in capturing the novel’s nuances (v), there are moments when referring to the endnotes may be tedious and distracting, particularly when the translation paraphrases the literalness (rather than translating the literariness) of the Chinese. For example, when Damo enters Teacher Wei’s humble abode, he thinks of the common saying, “home but four walls” (47). [ 8 ] This passage is followed by a reference to note #73, which not only explains that the expression means something akin to living in “miserable poverty,” but also offers the reader a general introduction to the world of chengyu, or idiomatic four-character phrases (462). Just as one may easily get lost in the endless network of information available on the Internet, one might get lost in this translation, which for better or worse seems to desire to relay an entire world of “cultural insider” information beyond the scope of Hu Fayun’s text, thus clouding its most insightful observations. With more editing and perhaps the publication of a scaled-down or abridged edition of Such Is This World, the potential appeal of the novel’s translation might reach beyond Sinophiles to offer comparative or more global perspectives to students and professionals in such fields as law, ethics, communications, epidemiology, and public health. This suggestion, however, is not meant to detract from the effort that has already been put forth in this translation as well as the admirable commitment of the book’s independent publisher, Ragged Banner Press, to “translating the literature of free minds from China,” as the publisher’s website proclaims. With the addition of the Tibetan poet Woeser’s (Weise) Tibet’s True Heart to the list of Ragged Banner publications, it is clear that this independent publisher is performing an invaluable service to the fields of modern Chinese and Sinophone literary studies by publishing important works—representing voices of authors marginalized from the political or cultural mainstream—that remain beyond the purview of larger corporate or academic publishers. 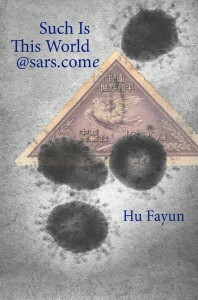 [ 1 ] Hu Fayun 胡发云, Ru Yan@sars.come [如焉@sars.come] (Beijing: Guoji guangbo, 2006). The novel was first published online. It took nearly three years and a series of imposed edits before the print version was finally published. Ragged Banner Press will soon be coming out with a paperback edition of the translation. [ 2 ] 网络的长处在这里，网络的隐忧也在这里了，一个东西，一旦滑出常轨，就会有副作用 (Hu, Ru Yan, 98). Emphasis added to portion omitted from the Chinese publication..
[ 3 ] Carlos Rojas, “Introduction: ‘The Germ of Life,'” Modern Chinese Literature and Culture 23, no. 1 (Spring 2011): 13. [ 4 ] 茹嫣身上的精气神，许多来源于她 (Hu, Ru Yan, 272). [ 5 ] 今年是我们市最关键的一年，春夏之交又是最关键的一个时刻，几个大的投资谈判，一批重要建设项目，一个世界性的投资洽谈会， 一个科技论坛，还有一个旅游节，看着就要泡汤了 …. 你该知道的，官场的一条不成文规则，就是拉出一个主要责任人垫背，是成本最低动静最小的解困法宝 (Ibid., 209). [ 6 ] 茹嫣这才知道，以为是一个自己当家的小沙龙，原来还有一个从未露面的婆婆在帘子后面盯着 (Ibid., 106). [ 8 ] The phrase is jiatu sibi 家徒四壁 (Hu, Ru Yan, 26). [ 9 ] Lao She, Rickshaw Boy. Tr. Howard Goldblatt (New York: Harper Perennial, 2010); Alai, Red Poppies: A Novel of Tibet. Tr. Howard Goldblatt (New York: Mariner Books, 2002).